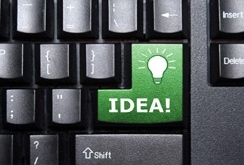 Most people readily accept that you must implement an idea for it to deliver future reward. Never realizing just how close they were to success when they gave up. And when they are not, people literally execute their ideas, products and services. A formulaic fact of business life is that a bad idea properly executed will prove more profitable than the best idea not followed through. Proper Execution + Proper Marketing = Proper Rewards. An average book, for example, properly marketed will enjoy more readership than a great work. A business formula that Katie Price, aka Jordan, has successfully adopted. There is nothing more powerful than an idea that is followed through.